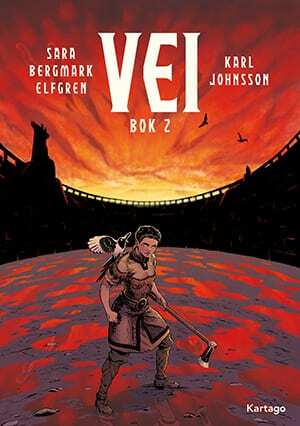 Vei – Book 1 is the first book in an epic story inspired by Nordic mythology. The second and final part, will be out in spring 2019. An unconscious woman is floating in the sea. She is found by Vikings in search of Jotunheim, the land of giants. 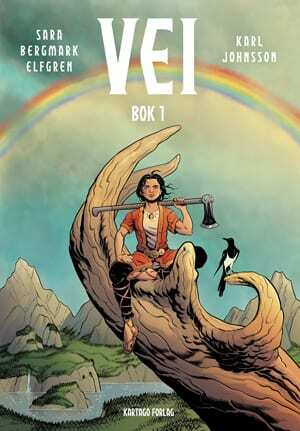 The woman’s name is Vei and soon she is drawn into a bloody battle between giants, Norse Gods and humans. Who can she trust? Sara B. Elfgren and illustrator Karl Johnson has worked very closely with the story as well as the images. The duo has found inspiration in the characters of Nordic mythology, and let them inhabit a universe where the Scandinavian Bronze Age villages meet Babylonian architecture. The result is a unique Swedish series, which the creators describe as “Nordic mythology meets Game of Thrones meets Gladiator”. “This is, without a doubt, one of the most visually appealing comics I have ever read. (…) I want to pause at every panel and savour the details. At the same time I’m so compelled by the story that I have to read on.